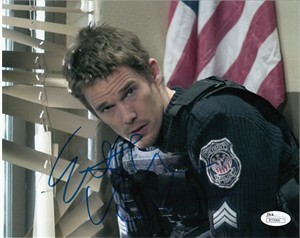 8x10 photo from the action movie Assault on Precinct 13 autographed in blue marker by actor Ethan Hawke. Authenticated by JSA with their matching numbered sticker and certificate of authenticity card. ONLY ONE AVAILABLE FOR SALE.